This is a spirited, exciting, idiomatic and by and large technically very persuasive collection of vocal and instrumental music by the near-contemporary (1649–1708) of Purcell, John Blow, by sopranos Zoë Brookshaw and Emma Walshe, countertenor David Allsop, tenors Samuel Boden, Nicholas Madden and Thomas Walker, basses William Gaunt and Callum Thorpe with the instrumental ensemble Arcangelo under their founder and director, Jonathan Cohen. 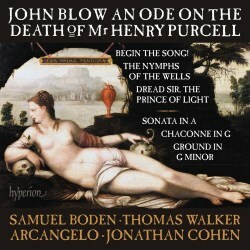 Blow was Purcell’s teacher and an accomplished musician in a variety of ways – teacher, organist, Gentleman (adult singer) of the Chapel Royal – and someone who recognised Purcell’s and Jeremiah Clarke’s talents so readily that he relinquished his posts at Westminster Abbey and St Paul’s respectively in favour of the younger men. With over 100 anthems, 10 services, 40 odes, more than 120 songs, a body of chamber and keyboard works and the earliest all-sung English opera, Blow was acknowledged during his own lifetime as the leading composer of the age. A CD like this one should go some way towards putting Blow into context. Only a couple of the works presented here are otherwise available in the current catalogue. From the very first bars of Begin the Song! [tr. 1-9] we sense that not only are all the performers thoroughly immersed in the world of late Restoration Britain with its love of the gently rhetorical and self-aware references to Graeco-Roman culture. But also that they are enjoying the energy, verve, momentum and sense of purpose which infuses Blow’s music, without a hint of stridency, insistence or spurious ‘abandon’ for effect. Indeed, there is as much delicacy and fruity sensitivity in the Ode on the Death of Mr Henry Purcell [tr. 11-17] after the G Major Chaconne [tr. 10] as there is drive. While Blow’s writing is not so inventive as that of Purcell himself, it has direction, purpose and as much restraint as amiability. Just listen to the solo, ‘The power of harmony too well they know’, in the Ode [tr. 15]. These qualities the performers on this CD have in almost every way. They are also aware of a drama which Blow holds in reserve in places; this creates a tension, in the resolution of which we cannot but delight. Purcell’s melancholy, by contrast, endures. The dirges in Dread Sir, the Prince of Light [tr. 26-29] are good examples; while never ‘jolly’, they suggest that hardships can be overcome, if there is an occasion to celebrate, as we do on New Year’s Day here. Blow’s melodic and harmonic inventions never go so far as to make us ache for ‘satisfaction’, as do Purcell’s. Nor do they build and develop as do Purcell’s. But they are genuine and heartfelt creations nevertheless. This is a tough balance to strike. It is desirable to avoid show for its own sake. But not to strip out all gesture for fear of being unnecessarily grandiloquent. The instrumental works also show how well the balance is achieved. Listen to the lovely tracery of the G minor Ground [tr. 18], for example: Cohen and Arcangelo pull us with them, rather than pointing a stick – however slim and short – at something already fixed in existence. The soloists are for the most part excellent, although the timbre and phrasing of Walker may strike some listeners as a little histrionic, almost, and more suited to C19th opera than to the subdued charm of the C17th. Although the occasion of some of these Court works would these days be seen as sycophantic, such strained staginess is really unnecessary given the expression which the music and texts can convey without almost elevating some of the (higher) notes in places, as he tends to. Both Zoë Brookshaw and Emma Walshe have sweet and airy, yet satisfyingly substantial, styles that are just right for the repertoire. Their duet, ‘But here comes a Druid’, in The Nymphs of the wells [tr. 20] is a delight. They pick out the contours and harmonies with just the right balance between precision and spontaneity. Indeed, spontaneity is an important quality in all this music: to many listeners it will appear strongly redolent of the more rounded and profound Purcell; so it may be hard not to make comparisons. Yet Cohen has made sure that the music here is offered in its own right. The acoustic is resonant and sympathetic to the spirit of Blow’s achievement. It focuses our attention on the music and performers, not on any sense of a ‘mounted’ performance. The booklet’s notes set the scene for those new to Blow, examine each of the works performed, and offer brief bios of Boden, Walker and Cohen as well as reproducing the texts. If music from this evocative generation or two in late C17th England appeals, there is no real reason not to investigate a well-conceived, executed and produced CD from Hyperion.